The Downtown Dozen is a fully student run endeavor that supports Jaguar Miracle at Augusta University. The race was born out of a desire for both the university and the Augusta community to support the hospital in serving children from all over Georgia in need of exceptional healthcare. All proceeds go towards the Children's Hospital of Georgia that provides excellent healthcare as a non-profit facility, relying on donations of people like you and organizations like us. Drawing inspiration from similar races in North Carolina and Athens, GA, the Downtown Dozen begins like any other race through historic downtown Augusta. However, at the halfway point, competitors are presented with a delicious challenge: a dozen hot and fluffy donuts. We hope you will join us to take part in this unique experience and opportunity to support a fantastic cause! Our aim is to unite the community of Augusta in serving the Children’s Hospital of Georgia by creating an unforgettable race experience. We want to bring people together to support this organization that has been so essential to the health and well-being of the children in our community. The proceeds generated from this race will help ensure that CHOG continues to provide exceptional care to its patients and their families. The Downtown Dozen is a race unlike any other that combines eating and running to create a fun environment for people of all fitness levels. Whether you race to win or are just there to walk and get your box of delicious donuts, this race is for you! All proceeds from the the Downtown Dozen will go directly to the Children's Hospital of Georgia to assist them in providing "breakthrough, family-centered care to patients." · Extracorporeal Membrane Oxygenation (ECMO) technology and team to provide heart and lung bypass as needed. ECMO can be used to keep the hearts and lungs of critically ill infants working. Elizabeth Peed was already a mother of two when baby Gates came along in April. He was born seemingly healthy, but within hours of his birth, he developed several serious, life-threatening infections. Not knowing if her baby would survive, the Peeds decided to make the two-hour trip via ambulance from Macon to Augusta and turn to the Children's Hospital of Georgia. Gates was transferred to the Children's Hospital of Georgia on April 5, 2013. When they arrived, about 25 personnel began working on Gates and preparing him to go on an ECMO machine. And, the procedure worked! "He just started getting better," Elizabeth said. "Originally, they said we think it's going to be about a 21-day ECMO run. He only had a six-day run on ECMO. "He feels like a miracle baby!" she said. "He's doing really well, just like a regular newborn. Eating, sleeping, crying, going to the bathroom. 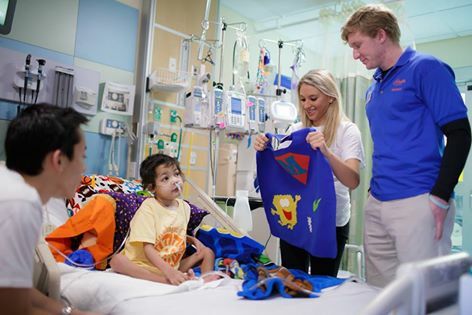 The feelings I have towards to Children's Hospital of Georgia are amazing. They were so friendly and made us -- they made us feel special," Elizabeth explained. "They have a lot of heartache, but they have a lot of triumphs. And they have a lot of miracles. And donations and money makes that possible. Gates continues doing well and, although he is still in physical therapy for stiffness on his right side due to the ECMO, doctors say it looks like there won't be any lasting damage from his illness. The first surprise for new parents Colleen and Lance Herr came when they found out they were having twins. The second surprise came when their baby boys, Ken and Ben, were born far too early, at 26 weeks.One baby was given just 24 hours to live, and his brother's odds weren't much better. "Ken ended up being on a ventilator, had seven blood transfusions, bleeding on the brain, a hole in his heart, he had bleeding in his lungs, he couldn't make red or white blood cells, he had a blood infection, urine infection, everything that could go wrong with him went wrong with him. It was kind of like the world was moving so fast around you, but you’re just kind of moving in slow motion," Colleen said. With the help of the Children's Hospital of Georgia, the boys have come a long way. They both almost weigh 17 pounds and are 8 months old.Ken and Ben were in the hospital three months total and were released right around what would have been their due date. "This is where we were supposed to be to deliver those babies. If we had've been anywhere else, I don't feel like they would have made it," Colleen said.